How do we understand and honor children's lives taken during the Holocaust? 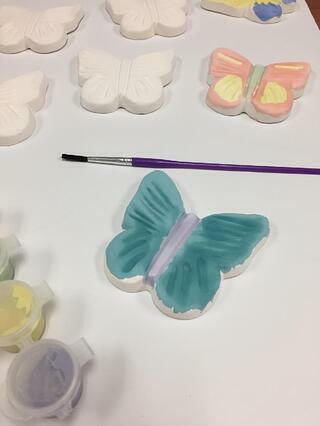 The Butterfly Project, founded in San Diego in 2006 and now reaching 20 states and 16 countries, seeks to involve young people in creating a ceramic butterfly for every child lost to the Holocaust. Over the past year, Facing History has been collaborating with them to deepen the experience of students in this powerful exploration and memorial to children. 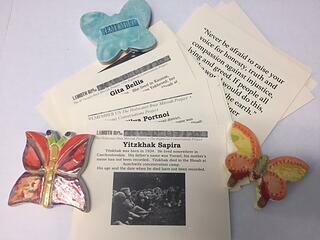 So what does it look like to put the focus on youth in your exploration of the Holocaust? The following path uses Facing History resources to deepen student appreciation for the meaning of painting a butterfly. This progression of lessons can be the basis for a middle or high school unit culminating in participation in The Butterfly Project. 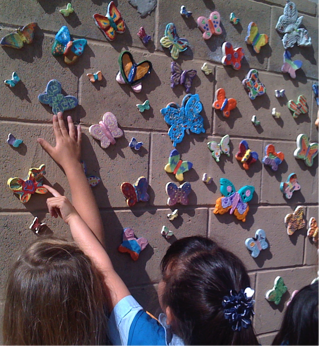 Each of the individuals honored by a butterfly had their own unique character and experience, just like each of our students does. While targeted for one aspect of their identity, each had a range of factors contributing to what made them who they were. In bringing back this complexity, we re-humanize them and help our students relate to these young people from many years ago. Step one: Create an identity chart for yourself. Once students create their own identity chart, you can have them use these to talk to other students in the class with prompts such as: Find two things you have in common. Share one thing that is very important to you now but wasn’t even on your identity chart 5 years ago. Step two: Create identity charts for a variety of young people pre-Holocaust. Since each person affected by the Holocaust has their own story, this is a way to honor the individual as well as see the range destroyed by the Holocaust. Short biographies can be found in Salvaged Pages (from I’m Still Here study guide and online resource). The Butterfly Project includes short biographical cards for individual children as well with their butterfly kits, so starting with the identity of individuals will also establish a foundation for the memorial at the end. Individually or in groups, have students do an identity chart for the individual they read about. Step three: Do a Gallery walk of the identity charts so students can see the range as well as the similarities among the young people and with themselves. Then discuss what they have seen. Variation: If you read The Diary of Anne Frank, Night, or Children of Willesden Lane with your students, this is a perfect way to explore how the characters change over time. Have students create identity charts at various points in the book to explore character development. In a history class, this exploration of individual children might be a small piece in a multi-week unit encompassing World War I, the Weimar Republic, and World War II, and Facing History has resources to support that. In an English/Language Arts or art class, how do you provide enough historical context for students to understand in a much more limited time? The video, I’m Still Here, is one way to continue with youth voices, drawing on diaries written by young people in the time leading up to and during the Holocaust. But I also like building knowledge collaboratively with a human timeline. This is a kinesthetic strategy which allows students to draw on knowledge they may already have and layer information upon information. Step One: Give each student a date from this timeline. Have students each hold their date and form a U-shape OR have students place their dates in a line or U-shape on the floor to create the timeline. If students are holding their dates, have them read the events and dates one by one in order. If they have placed them on the floor, have students walk the timeline to read the events. Step Two: Interact with the timeline a bit to process and analyze the progression. Whichever way you set up the timeline, you can interact with the timeline with a variety of prompts. Walk to or identify a date/event which surprised you. Walk to our identify the date/event you consider most significant. Walk to or identify the date/event you consider the “turning point” – or “point of no return” in leading up to the Holocaust. Walk to or identify a date/event which you find confusing or contradictory. Step Three (optional): If you are reading a longer piece, give the students additional dates/events specific to your piece of literature. Have the students add these new dates/events to the timeline. It is also nice to have students read an excerpt from the diary entry for that day or an excerpt from the book related to that event to bring the voices of those young people into the timeline. Youth during the Holocaust - how was identity lost? The latest edition of the Holocaust and Human Behavior includes a greater variety of youth voices than past editions, which provides an opportunity for understanding the complexity of decision-making. Here are a few samples which could be used in a Jigsaw to bring more nuance to the question of youth experiences. These also show the dehumanization which happened across a wide range of experiences. For those teaching one of the longer pieces of literature, this theme of identity lost and dehumanization could be just as easily explored in the Diary of Anne Frank or Night by having students pick out examples from the text. In what ways, for example was Anne Frank’s identity challenged? …lost? …kept from being seen? In what ways were those in the annex dehumanized? And conversely, in what ways did they keep their humanity despite external forces? How to teach the Holocaust itself is always a difficult question, and one best answered by the teacher who knows her students well. 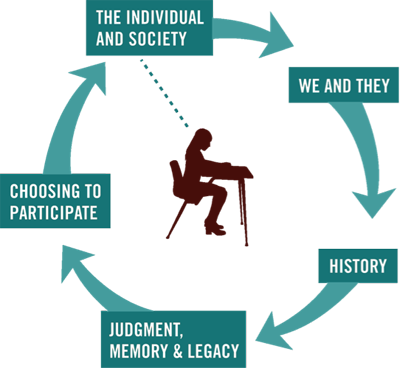 Facing History has found that it is often problematic to use graphic images and films or to attempt to use simulations to help students understand aspects of this history. Such resources and activities can traumatize some students, desensitize others, or trivialize the history. We urge teachers to create space for students to have a range of reactions and emotions. This might include time for silent reflection or writing in journals, as well as structured discussions to help students process content together. Some students will not want to share their reactions to emotionally disturbing content in class, and teachers should respect that in class discussions. For their learning and emotional growth, it is crucial to allow for a variety of responses, or none at all, from students to emotionally challenging content. This poem by Holocaust Survivor Sonia Weitz introduces Chapter 9 of The Holocaust and Human Behavior, and sets the tone for exploring narratives about the violence of the Holocaust. upon the altar of insanity. and trace the eclipse of humanity . . .
. . . has yet to learn why. This is a key motivation for many teachers who include Diary of Anne Frank, Night, or other pieces of Holocaust literature in their curriculum. Whether or not you use these longer pieces, you can bring survivors’ voices into your classroom. Just as it is vital for students to be able to process the difficult events of the Holocaust, it is essential for us as a human society to grapple with what happens AFTER war. Memorials are one way to do this, and a very public way for a society to both acknowledge loss and express hope for the future. This is where The Butterfly Project presents a great opportunity for students to both explore the meaning of memorials and choose to be part of creating a memorial themselves. Step One: Using the visual essay from Chapter 11 (reading 15), create a Gallery Walk. Students could explore this silently or while talking with each other about what they see. 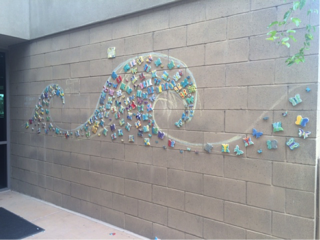 As students paint, or reflect on the installation of butterflies created collectively, there are a few final pieces which can help students recognize the power of their own voice, and of the choices they make. Facing History has a number of great pieces on this, but in thinking so much about youth in relation to our work with The Butterfly Project, I particularly liked considering the reading, Bullying at School (reading 2). Imagine if your first day of high school you endured ridicule and taunting, but on the second day, upperclassmen you did not even know found a way to show you that you belonged at that school and they were going to stick up for you. It literally brings tears to my eyes. Step One: Read Bullying at School aloud. Step Two: Have students journal about their own reflection on the piece. Step Three: Consider the knowledge, skills, and dispositions displayed by the upperclassman in Bullying at School (draw a three-circle Venn Diagram to chart student thoughts). Then have students add to their reflective writing. Step Four (optional): Have students read additional pieces from Chapter 12 and consider the knowledge, skills, and dispositions used in those pieces. We encourage you to check out all that The Butterfly Project has to offer, and the deep way Facing History and Ourselves resources can prepare students to get the most out of this project.